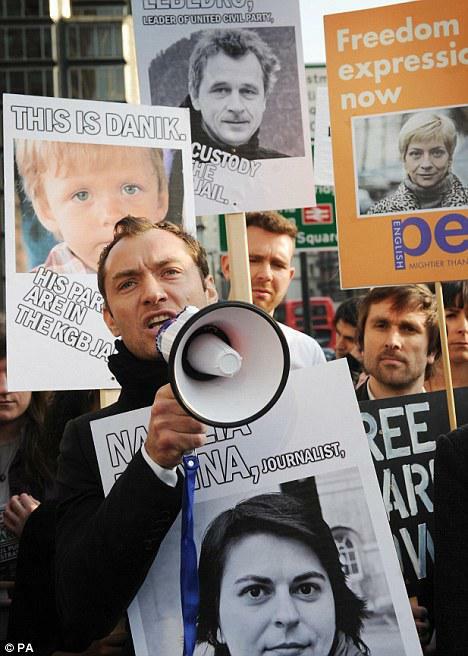 Jude Law and Kevin Spacey took some time away from their busy schedules to join 100 other campaigners last night to fight for the freedom of expression in Belarus. The protest began outside the PR consultancy firm Grayling, in the center of London, as they tried to put pressure on the company to stop working with the former Soviet Union state. Other famous faces that could be spotted in the crowd included actor Roger Pack and playwright Sir Tom Stoppard. Belarus is currently being held under a dictatorship by president Alexander Lukashenko and the actors were protesting for the release of countless political prisoners that are being held in the country’s jails. Jude is not an uncommon fixture at peace protests as the Sherlock Holmes actor is an ambassador the the Peace One Day charity which aims to stop all wars across the world for just one day every year.